OBIX (Open Building Information Xchange) is a Rest Web Service used in Building Automation by many companies around the world to exchange real time data with TCP, HTTP. Click here for the OBIX API reference manual. 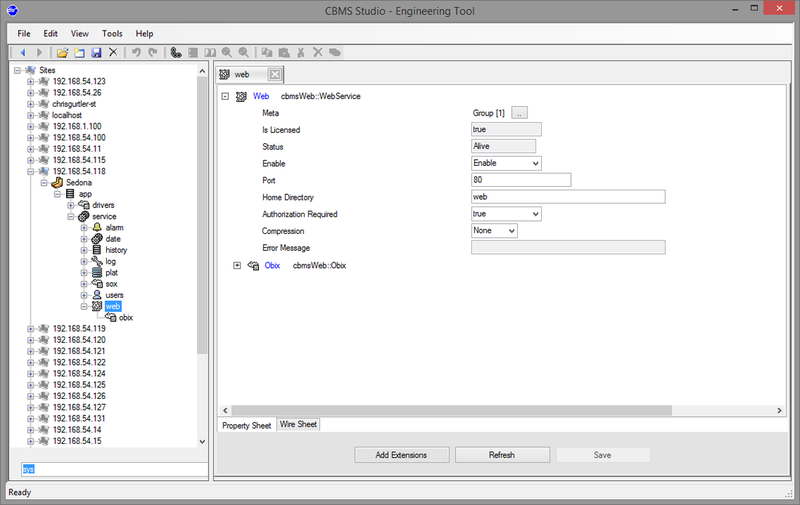 CBMS supports OBIX in both XML and JSON format in the following products. 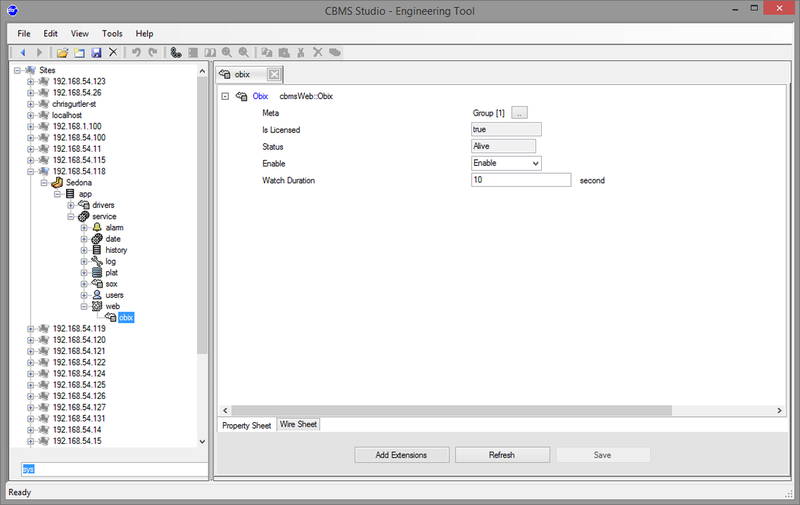 Using the OBIX Rest Web Service you can communicate to the CBMS products with an OBIX client or a web browser. Setting up the OBIX service requires very little work. The driver is installed by default with a component called OBIX which must be a child to the Web Service component as shown in the diagram to the left. 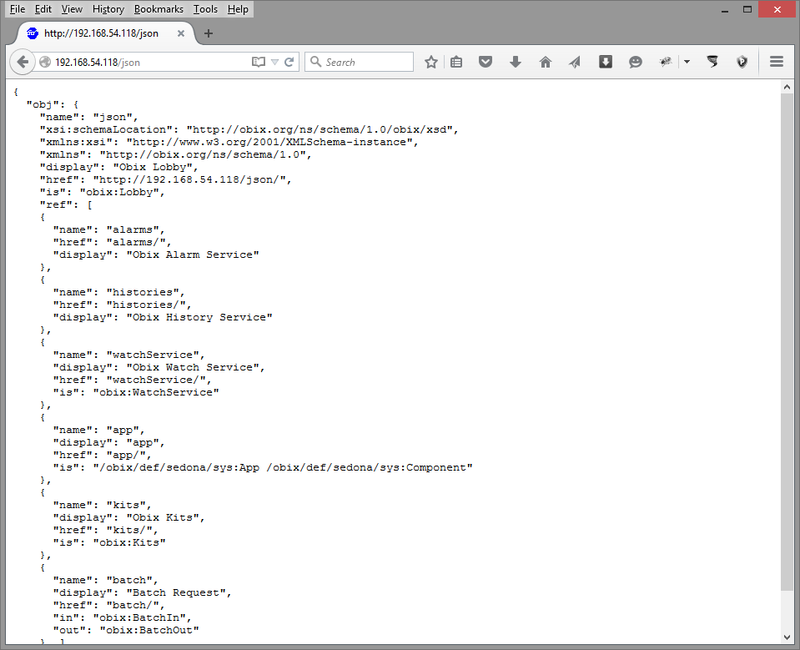 The OBIX driver will be operational if the Status property is Alive which indicates that both the XML Rest Web Service, and the JSON Rest Web Service are running. The CBMS Web server supports basic authentication and compression. When authentication is set to true the the OBIX web service will require a username/password to be enterred. When compression is set to true, then the results returned by the web server will be compressed if the client supports compression. To change these settings, navigate to app/service/web using the Engineering Tool. To verify that the web service is operational open a web brower and enter the name ip address of the CBMS device followed by either obix or json, eg http://localhost/obix. If authentication is set to true then you will receive a login dialog. Enter your username and password to display the OBIX rest Web Service. 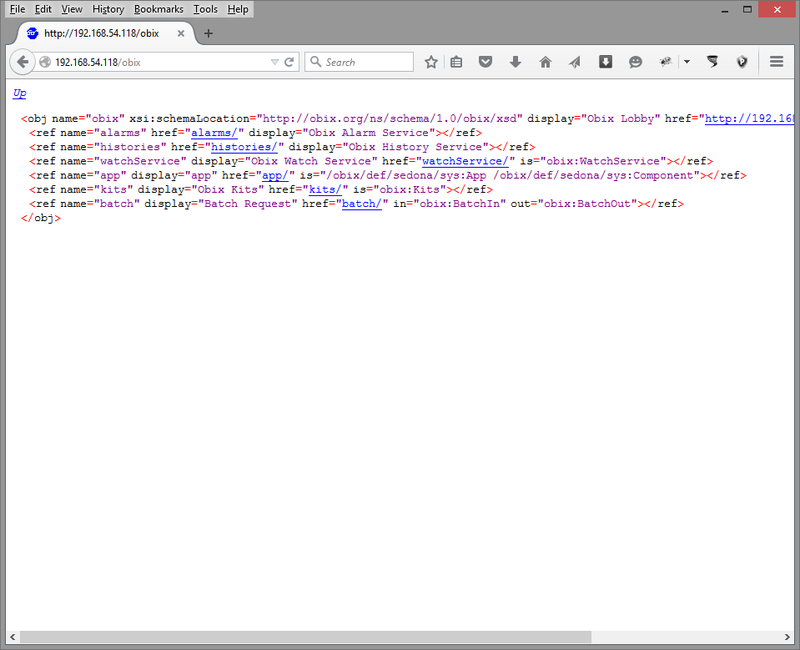 The output for both the XML and JSON Obix Rest Web Service are shown on the right. The "lobby" is the root object in OBIX and has folders for alarms, histories, watchService and batch. The OBIX protocol specification has a complete discription of these folders and how they operate. The Sedona application appears in a folder called app and it is built dynamically from the application using the same tree structure. When you open the app folder, all of the children and slots (properties and actions) will be displayed for the app component.